Mount Prospect, Ill., September 26, 2008 – Vermont American is one of the best known and trusted brands for contractors, DIYers, and hobbyists because they consistently deliver quality products at affordable prices. 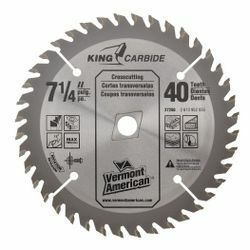 They have now introduced a new line of circular saw blades, aptly named King Carbide for its large resharpenable teeth, with a product line offering something for each of these audiences. All blades have a heavy, fully-hardened plate to resist deflection under load, laser-cut body with precision tolerances for accurate cuts, tri-metal shim braze that increases impact resistance for longer life and helps prevent fractures in the carbide teeth, patented C3 Dyanite™ carbide that lasts 6 times longer than standard carbide and their extra-large teeth that allow re-sharpening for extended life. The 27247 blade is designed to work with 6-1/2” standard or wormdrive circular saws and has a 40-tooth count to deliver clean cuts whether ripping or cross-cutting. The vast majority of portable circular saws use a 7-1/4” blade and Vermont American has introduced six new blades to tackle a variety of applications. All blades include a diamond arbor knock-out for wormdrive saws. 27248 – Designed for ripping, this blade has 12 teeth and a Flat Top Grind (FTG) configuration. In tandem, these features allow users to cut wider boards along their length or quickly resize plywood or building panels. 27249 – Able to rip or cross-cut, the blade has 24 teeth and an Alternate Top Bevel (ATB) tooth configuration. 27250 – Rip or cross-cut, but with a 40 tooth ATB configuration, this blade produces a cleaner cut for pieces where a smoother finish is desired. 27350 – This blade is made with the remodeler in mind. The 14 tooth, Triple Chip Grind (TCG) configuration can easily cut through old walls or flooring which may occasionally contain nails. 27355 – Expressly engineered for cutting laminates, this 40 tooth blade has a TCG configuration to produce clean cuts while reducing chipping. 27390 – A 40 tooth blade with a TCG tooth configuration designed to cut non-ferrous metals and plastics. The flagship of this line is the 27350, which features a fully hardened plate, a TCG grind, and a negative hook angle with tri-metal shims to reduce the possibility of tooth damage when hitting nails or staples. This blade can quickly cut through multiple materials and its deep gullets make sure the debris is effectively removed to reduce build-up and reduces strain on the blade, making it the ideal choice for remodeling or demolition work. The line includes both an 8” and a 9” blade with 40 teeth and an ATB configuration. These blades are designed to work with competitive miter saws and older table saws. 27256 – This general purpose blade can manage any task due to its 40 tooth ATB configuration. 27316 – Best suited for cross-cuts with a 60 tooth ATB configuration. 27716 – Made with woodworkers in mind, this fine finish blade has an 80 tooth ATB and is ideal for miter saws. 27356 – A larger laminate blade with more teeth and a 60 tooth TCG grind. 27416 – Made for non-ferrous metals such as aluminum extrusions, copper tubing, and plastics with a 60 tooth TCG design. The 12” blades are designed for wood applications. 27257 – Similar to the 27256 with a 40 tooth ATB configuration. 27317 – Made with cross-cuts in mind, a 60 tooth ATB configuration. 27353 – Another finish blade with 80 teeth and an ATB grind. Visit www.vermontamerican.com to find a retailer.